Instantly identified by its deeply grooved shell sculpture (like the marks left by a cart in mud) this species lives exclusively in high energy rocky shorelines or platforms, often at or just below the tideline. 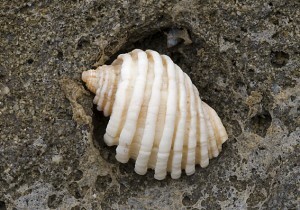 Shells may reach a length of over 100mm, but typically adult specimens reach 60-70mm. Specimens are often partially encrusted by limey worm tubes or barnacles which inhabit the same rocky areas, and possibly this may serve as camouflage from predators for the otherwise exposed whelks. Cart-rut Whelks feed on other molluscs, barnacles and tubeworms. They belong to the family known as Murex snails (Muricidae), many species of which possess shell spines. Indigenous: Eastern and southern coasts of Australia and also New Zealand.